It is not uncommon for a terrazzo floors to be coated or waxed with a topical finish. 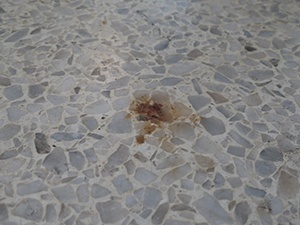 The only way to know whether the stain is in the topical finish or in the terrazzo itself is to remove any old finish. If you are certain that your terrazzo has a natural, honed or polished finish then you can skip the stripping process described below and move on to the poultice application. Also note that most modern terrazzo is made with a resin matrix that will soften if stripped. If you are sure that your terrazzo has an older cementitious matrix, you can safely proceed with stripping. If you have any doubts or know that you have a newer, resin matrix terrazzo floor, do not apply a stripper to your terrazzo. Please contact your stone restoration contractor for guidance. It is very important to note that floor stripper is very caustic and can cause injury or damage. You must wear heavy latex gloves and eye protection and use masking tape and plastic to protect the floor surrounding your work area. Mix one part water-based floor stripper (the same kind used for vinyl tile or polymer finishes) with six parts water and apply to the stained area. Allow five minutes dwell time. Agitate the solution with a green scrubbing pad. Use an absorbent white cloth or paper towels to soak up the solution. Then, repeat this entire process. At this point, if the coating was stained and not the terrazzo itself, it is possible that the stain may be gone. If so, use a pH-neutral, stone-safe cleaner to remove any remaining stripper and clean the area. If the stain is still there, that means it is in the terrazzo, and you can try to remove it using a poultice application. Please note: If your terrazzo has a natural, honed or polished finish, there is no need to strip or reapply coatings. If you stripped the stained area, you removed the topical finish. That means you now have a small area that looks dull compared to the surrounding floor. To resolve this problem, use a paint brush to reapply a water-based finish. It may take up to eight coats to give the work area a nice, even sheen that blends with the surrounding area.